Your home’s gutters serve an essential role in protecting your home from precipitation. If the gutters are not functioning properly, rain, snow, and ice melt will run off of the perimeter of the roof. When it does, it can create significant property damage through wood rot, staining, and erosion around the foundation. Gutters collect and channel water in a controlled manner to prevent property damage. However, they must be clean and well-maintained in order to do their job properly. You should plan to clean your gutters throughout the year, and these are the proper steps to take to get the job done right. 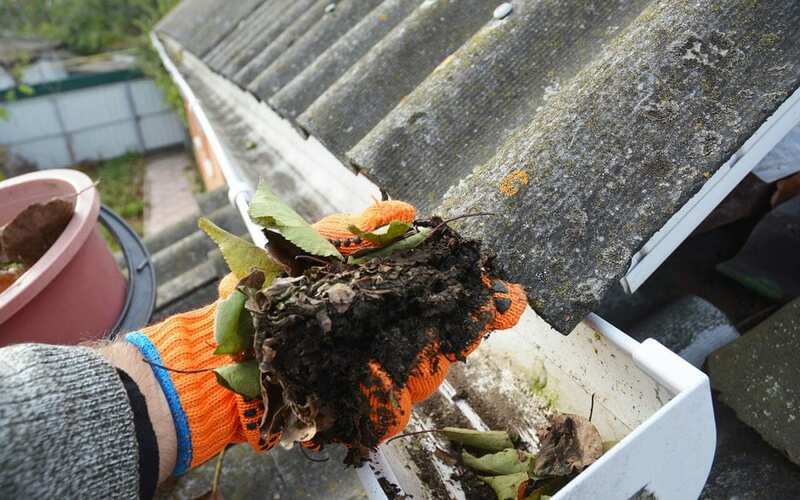 During autumn, the leaves fall and increased rain and wind send other debris into your gutters. This can ultimately result in the blockage that prevents the gutters from working properly. When it is time to clean your gutters, follow these effective steps. If you intend to clean your gutters yourself, begin by gathering the supplies to complete the project. Common supplies that are needed include a water hose, a ladder, a bucket, and gloves. If some of the debris has matted together, you may need a trowel or spade to scrape the material out. Hanging a bucket on the ladder gives you a place to deposit the debris instead of just dropping it all over the yard. Cleaning your gutters is also a great time to repair damaged areas. With this in mind, you may need to have rivets, screws, and other supplies and tools available to complete repairs. Once you have all of your supplies ready, you can begin the cleaning process. The first step is to remove all clumped matter and accumulated debris. This is usually completed by hand, so put durable gloves on to keep your hands clean and protected. Remember that some of the material could have bugs, mildew, or other elements in it. Use the trowel or spade to scrape matter out as needed. After you have removed the bulk of the debris, you are ready to thoroughly rinse the gutters with a hose. Some homeowners will use soapy water to remove mildew. Spray a powerful stream of water down the entire length of the gutters. Then, take the additional step to position the water stream into the downspout. When the water runs clear at the bottom of the downspout, you will know that this step has been completed. As you make your way around the perimeter of your house to clean your gutters, you may notice at least a few areas that require repair work. For example, a bracket may have become dislodged from the home, and that section of the gutter may need to be re-anchored to the home. If your gutters do not currently have a shield or guard in place to prevent debris from falling in, now may be a great time to make this upgrade. Doing so will prevent you from having to clean your gutters as frequently. Gutters are an essential aspect of a well-maintained home, but they must be kept clean in order to be effective. Seasonally, assess the condition and cleanliness of your gutters to determine their condition. When you need to clean your gutters, simply walk through these steps to get the job done. Remember that you can hire a professional if you are not up for the job. Appalachian Inspection Services serves Western North Carolina with home inspection services. Contact us to book your appointment.